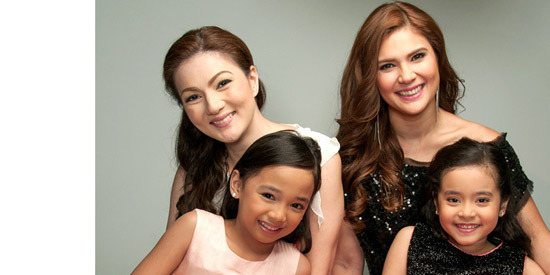 In May Isang Pangarap, Carmina Villarroel plays the mother of Larah Claire Sabroso (wearing peach) while Vina Morales is cast as the mother of Julia Klarisse Base (wearing black). NEW KAPAMILYA CHILD STARS TO BE INTRODUCED IN MAY ISANG PANGARAP. ABS-CBN will soon launch its newest child stars through its upcoming Primetime Bida drama series titled May Isang Pangarap. Viewers will soon get to know eight-year-olds Larah Claire Sabroso of Davao City and Julia Klarisse Base of Manila. The two girls were both discovered from the Kapamilya Network’s nationwide talent search "Kapamilya Little Star" held in 2012. May Isang Pangarap will also tell the story of the Larah and Julia’s supportive mothers who will be portrayed by Carmina Villarroel and Vina Morales, respectively. Also featured in the series are Rico Blanco, Erin Ocampo, Dominique Roque, Bembol Roco, Shamaine Buencamino, Dennis Padilla, Gloria Diaz, Valerie Concepcion and Ron Morales. It is under the direction of Jerry Lopez Sineneng. May Isang Pangarap will air soon on ABS-CBN Primetime Bida.